Summary: A lot happened at GTC before these results and I am no longer as keen on the group as I once was. That said, the figures from this specialist data supplier to the oil and gas industry were not truly awful — a profitable second half gives hope that one day the business will recover. The asset-rich balance sheet also lends support. But a new boss and various acquisitions just don’t make me entirely comfortable. I continue to hold. A profit warning was issued in June that blamed a “very depressed” oil and gas market. The alert was not too surprising given GTC supplies geological data to the sector, but at least the group did say it expected to generate a profit before tax for the full year. That profit expectation was reassuring given the first-half loss, but closer inspection of these 2016 figures showed the reported profit was achieved only through a one-off gain (see later). GTC agreed to buy this geographical information systems consultancy for £1,760k during July. “It seems this deal will diversify GTC’s services to the oil sector, as well as diversify its services to outside the oil sector. As such, GTC’s dependence on its proprietary geodata libraries will diminish, which may help in the shorter term, but long term — assuming an oil-sector recovery — may not make the group’s margins and cash flow as attractive as they once were. GTC announced the appointment of Dr Jonathan Copus as chief executive during August. Dr Copus has worked as an exploration geologist at Royal Dutch Shell, as an equity analyst at Deutsche Bank and as chief financial officer at Salamader Energy. He is only 44, too. The appointment did not look too bad in the circumstances. When I bought my GTC shares during 2013 and 2014, the firm had been run by a long-time employee, had not bought other businesses and appeared to boast an array of lucrative, proprietary data. All that was enough to keep me holding the shares as the business suffered from the oil-price crash. However, now there is a new chief exec, while the aforementioned Exprodat deal and the larger ERCL purchase have signalled (perhaps) that the proprietary data may not be all that lucrative anymore. As such, I am starting to feel there may be better long-term homes for my GTC money. 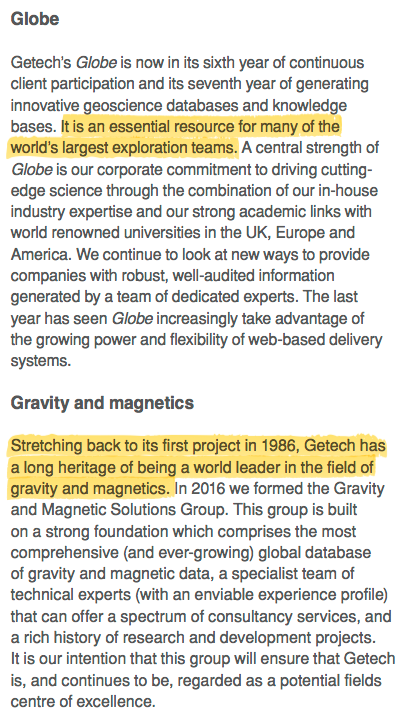 You see, what has become (belatedly) obvious to me is that GTC does not compare too well to, say, BrainJuicer and Bioventix — two new shares I bought earlier this year — both of which are run by long-time, owner-founder executives who don’t rely too much on acquisitions for growth. Reported revenue dropped 19%, though don’t forget the 2016 performance was supported by a full-year contribution from ERCL. Had ERCL been owned throughout 2015, the revenue drop for 2016 would have been 40%. I think it was somewhat cavalier of the group to suggest in June that these results would show a pre-tax profit — and not explain that such a profit would be underpinned only by this one-off gain. A few extra contracts talked about at the half-year stage combined with an underlying 17% reduction to the cost base gave rise to a second-half profit. 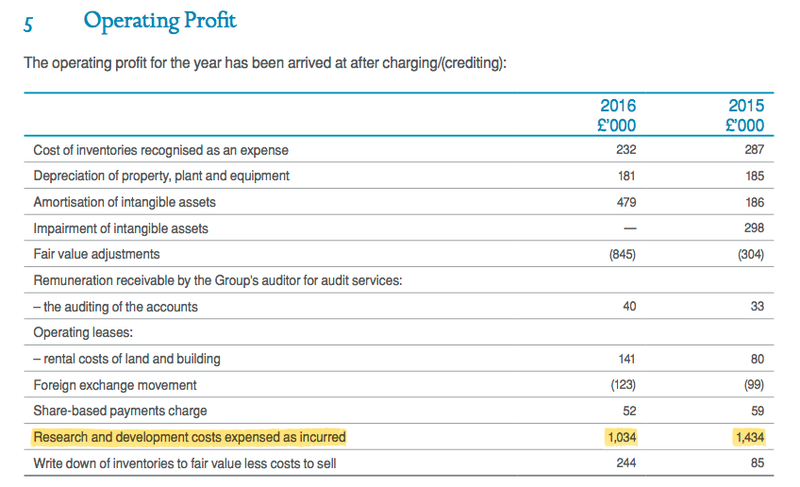 Adjust for the aforementioned £845k gain and the H2 operating profit would have been £545k. Still, that level of H2 profit does not feel too bad in light of the first-half loss and June’s profit warning. Although GTC’s cash flow shows nothing obviously untoward, there are a few niggles. Capitalised development costs is now one area I’m unsure of. In the past I had concluded the firm’s hefty intangible expenditure — which is not charged against profit but instead travels directly to the balance sheet — related to a certain multi-satellite project. Expenditure of £824k and associated amortisation of £479k leaves a £345k difference — which is a notable sum for this small business. I do not mind capitalised expenditure, just as long as the associated amortisation is adequate and reported profit is not boosted artificially. GTC’s balance sheet remains relatively strong. Alongside net cash of £1.9m, there is freehold property that should continue to carry a £2.5m book value (the upcoming annual report should confirm this). This liability reflected GTC’s potential payment to cover an earn-out relating to the ERCL purchase last year. I had sensed this earn-out was somewhat high given how the wider group had performed following the acquisition. To cut a long story short, I reckon the earn-out provision is now £135k and has to be paid during the current financial year (to July 2017). I am not really tempted to buy more GTC shares because of my earlier comments about the company diverging from the bulk of my portfolio. However, for now at least, the business has net cash, enjoyed a profitable H2 and still provides a range of specialist data and services — although revenue from the wider group is now increasingly earned from other products. I suppose one day I could look back at GTC and declare the current 28p share price as having been a superb buying opportunity — assuming the oil and gas sector recovers and GTC capitalises on the revival. In the meantime, though, I guess other businesses with greater tenured management and less dependence on acquisitions could also generate robust returns. Here’s what I noted in the latest annual report. A few more snippets from GTC that suggest the main business (pre-acquisuitions) enjoys a good competitive advantage. I thought disclosing shareholders with 3% or more of the company was the standard for annual reports. At least Dr Carey leaves at the end of 2016, so I guess his absences are understandable. Mr Edwards was the lead executive of ERCL, so his absences are a bit of a shame. 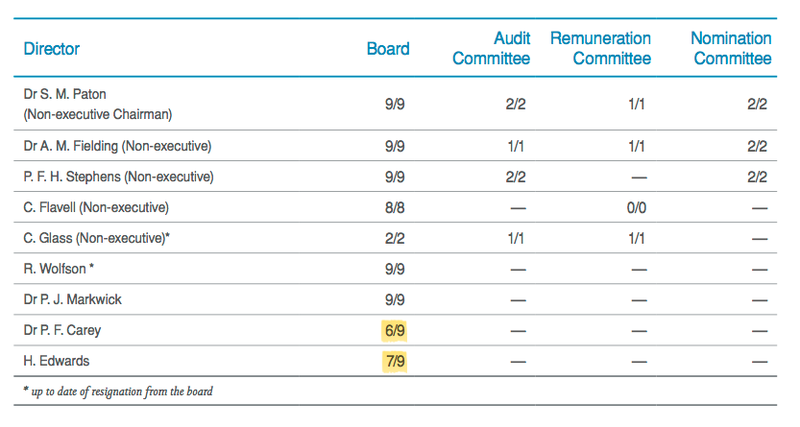 I am pleased there were two audit meetings against one remuneration meeting — I do prefer my boards to talk more about audits and risk than their own pay. 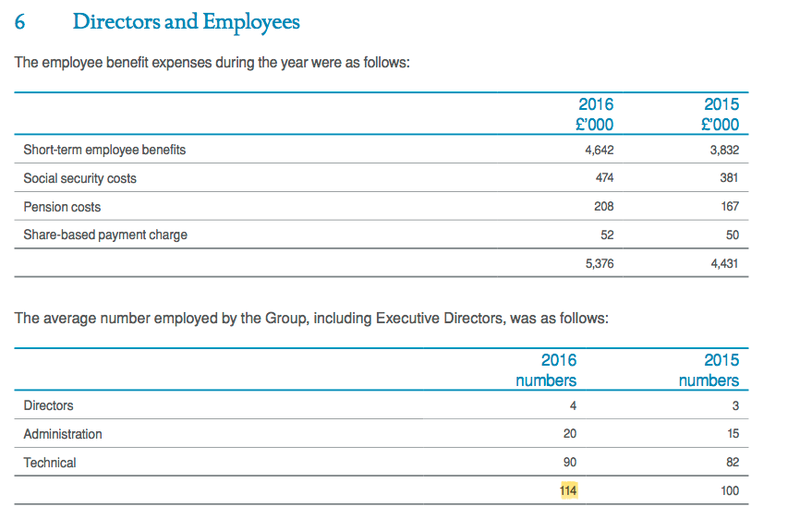 Nice to see non-execs Fielding and Stephens taking fee reductions this year and doing their bit to reduce costs. Non-exec chairman Dr Paton enjoyed a greater fee, presumably due to his increased workload following the chief exec change. 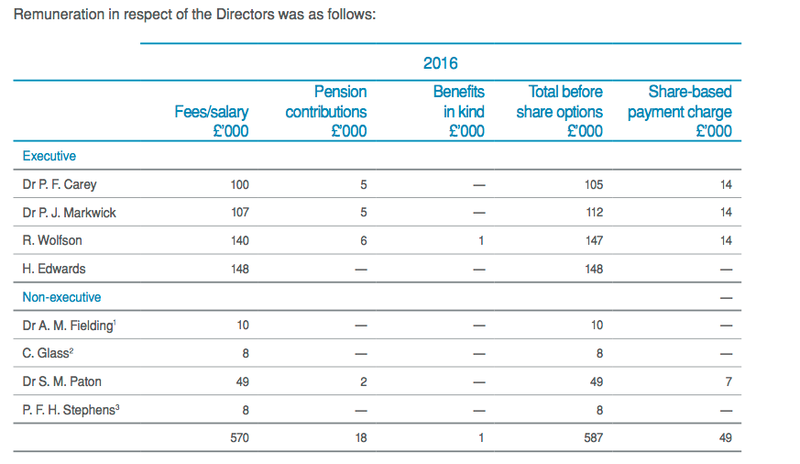 It is unusual that a non-exec chairman receives a pension contribution — I get the impression he is more part-time non-exec/part-time exec. Exprodat brought 20 new employees to the group in June 2016, and ERCL brought 26 new employees in April 2015. So 46 new ‘acquired’ staff were employed during the last two years when average staff numbers went from 75 to 114 — an increase of 39. It therefore seems to me the headcount at the main business has been reduced by 7 (39 less 46) — which does not seem a lot of redundancies. Firstly, GTC’s 2016 performance was not dominated by a particularly large client. Between 2011 and 2015, every year saw at least one client produce 12% or more of total revenue. 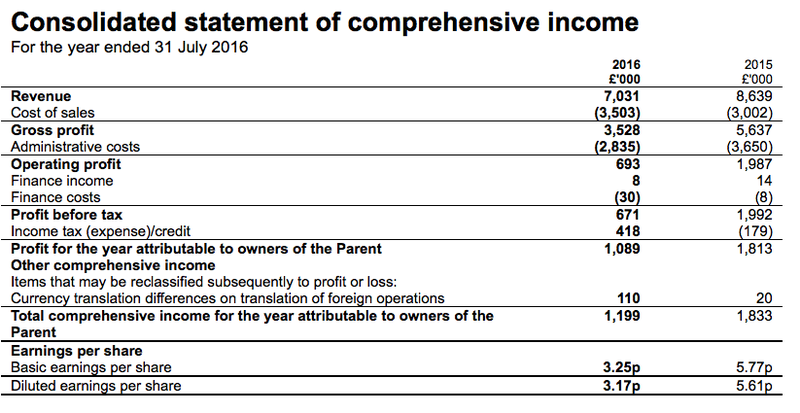 Secondly, we have confirmation that UK revenue represented only 12% of total revenue. I trust the weaker GBP could help GTC’s top line during 2017. Not great, but perhaps understandable given the group’s position. The R&D figure reported for 2015 was £1,341k in the 2015 annual report — so an unexplained adjustment has occurred to show it now as £1,434k. I therefore reckon Exprodat recorded revenue of £2,408k and a pre-tax loss of £264k for the year to 31 July 2016. That compares with revenue of £3,419k and a pre-tax loss of £109k reported for calendar 2015 as disclosed at the time of acquisition. 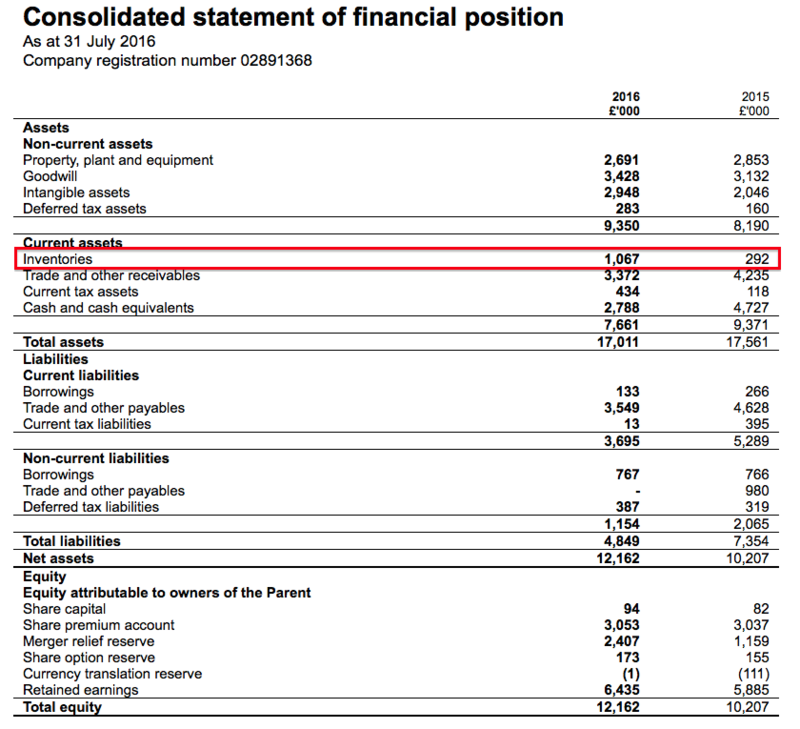 The £109k loss was explained at the time as being due to “one-off restructuring expenses“, and I trust the £32k profit Exprodat recorded during its 7 weeks or so as part of GTC is more representative of its future performance. 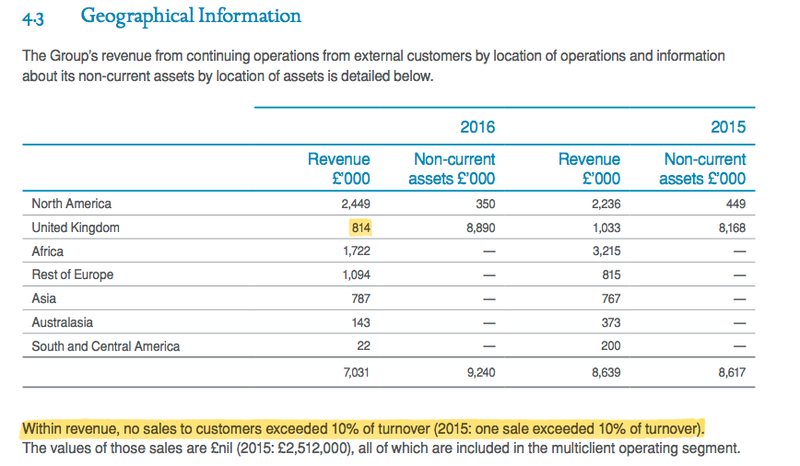 That said, Exprodat suddenly losing revenue of £1m is quite scary — unless some of that revenue was actually from GTC itself. 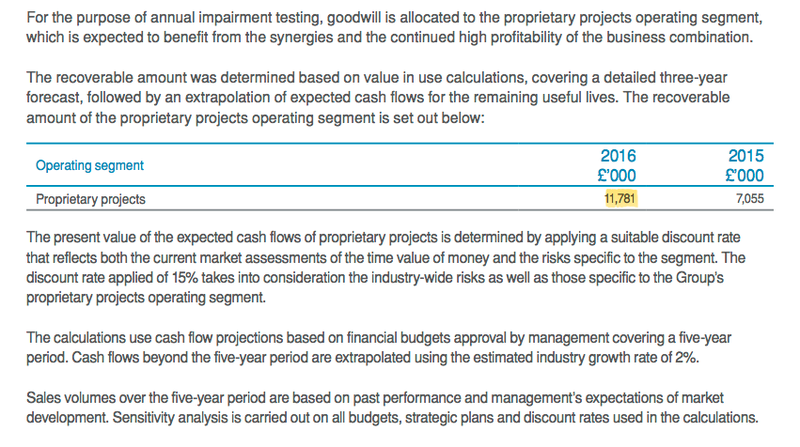 It appears to suggest GTC’s acquired goodwill — which is in the books at £3m — could actually be worth almost £12m. For context, GTC’s current market cap is £10.5m at 38p. First, other payables now total £635k. It has never been 100% clear, but I have deduced other payables have mostly represented the future earn-out payments of acquisitions. The £845k write-off mentioned in the Blog post above has essentially cleared that £980k other payable liability, and the remaining £135k must now be part of that £635k figure. Also, GTC remains on the hook for £250k to pay for Exprodat, which is I guess also included in that £635k. Second, deferred income and accruals remain sizeable, albeit lower than 2015. This entry generally represents upfront payments from clients for services yet to be delivered, and it is useful to have such income on the balance sheet ready to be ‘earned’ for 2017. 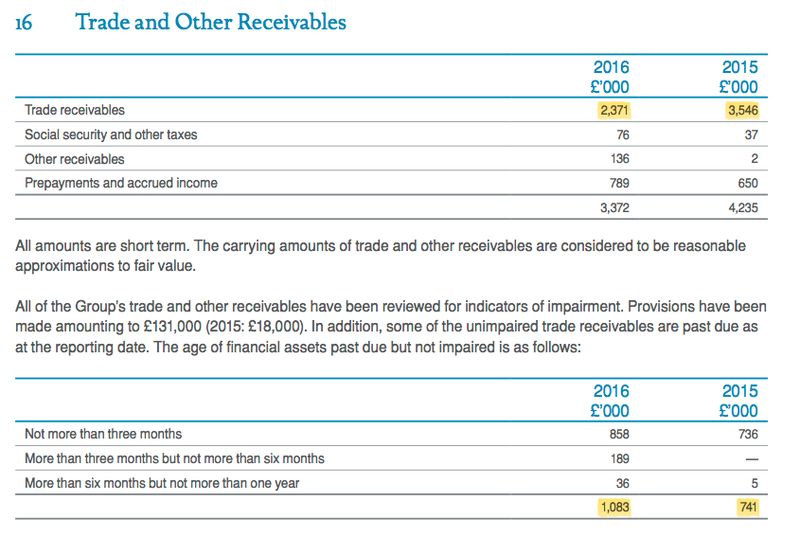 While year-end trade receivables of £2,371k represents a not-unusual 34% of revenue, the size of receivables past-due-but-not-impaired has increased during a year when revenue actually decreased. These past-due-but-not-impaired receivables represent 15% of 2016 revenue — for perspective, the figure bobbed between 3% and 9% during the previous five years. Maybe this is purely a timing issue. Or maybe GTC’s hard-pressed oil-sector clients are struggling to settle invoices. 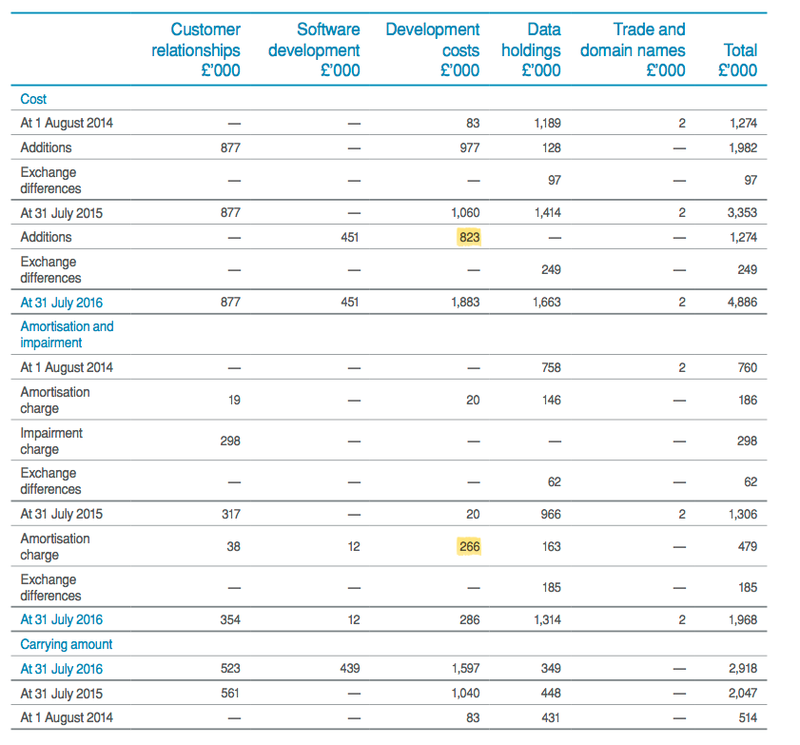 It seems to me GTC spent £823k on internal intangible developments and the associated amortisation was £266k — a sizeable £557k difference that is greater than the figure I had mooted in the Blog post above. Within the annual report, GTC confirms the multi-satellite project -=- which I believe these development costs relate to — has now been completed. As such, I do not expect major intangible expenditure next year. But that may prove to be wishful thinking. Either way, the amortisation charge should be somewhat higher during 2017. GTC’s freehold is now valued at £2,475k and 2,250k options represent 6.0% of the total share count. I was quite surprised by this statement, not least because it was GTC’s first AGM statement since 2009. The statement also contained some welcome news about contracts. “In 2016 Getech focused its operations on targeted investment in our core business, counter-cyclical M&A, and the active management of costs. These actions combined to deliver a significant rebound in profitability in the second half of our 2016 financial year. Since reporting 2016 results, we have secured several strategically important new contracts and our day-to-day activities continue to be focused around the customer, profitability and diversified growth. In 2016 Globe entered its sixth year of continuous customer support, the MultiSat programme was delivered, a wide range of new Regional Reports were released and we completed an extensive, multi-disciplinary basin review for Sonangol. We continued to support the Mozambique Government’s petroleum activities, captured new World Bank funded consultancy opportunities in Sierra Leone and in June 2016 we strengthened our offering through the acquisition of Exprodat, a provider of cutting-edge Geographic Information Systems (GIS) services and software products. Since the completion of this transaction, Getech has focused its geoscience, GIS, software and consulting skills on growing the Group’s operations both within and beyond our core oil & gas exploration customer base. It is pleasing therefore to announce that we are ending the calendar year having secured a new sale of Globe phase-two to a super-major, and we have been contracted by the UK Oil and Gas Authority (the “OGA”) to develop and implement a GIS information management strategy. This work for the OGA extends our operations beyond our core exploration market, being focused on spatial data that spans the full E&P asset life-cycle. In addition, having won our first contract within the nuclear industry in the previous financial year, Getech is currently at an advanced stage of discussions to expand on this work. As previously announced, financially, 2016 was a year of two distinct halves. In the first half, slow trading and higher costs lead to a loss before tax of £704,000. In response, Getech took a range of hard decisions and implemented a significant programme of cost control measures. From a lower cost base, and with a 14% rebound in revenues, our underlying performance significantly improved in H2-16; the Group reporting a full year profit before tax of £671,000. We believe these operational and financial highlights illustrate that despite the challenges faced by the wider natural resources market, our clients continue to see value in our integrated, multi-disciplinary approach, which in turn is underpinned by excellent data, high quality staff, and a strong GIS platform. The Board however also continues to act with prudence. The Group remains focused on cost control throughout the business and the Board decided to not propose a 2016 dividend. Looking to 2017, although the outlook for our core exploration market remains uncertain, feedback from customers leaves us cautiously encouraged by the market mood. We have no intention however to sit back and wait for a rebound. With an expanded operational skill set, Getech is entering a period where we are focused on profitability and opportunities to enhance and diversify our commercial offering. We will do this through an improved value proposition around our activities, the provision of better access to our data/analysis and refocusing of our products and services so that they more practically address the day-to-day commercial challenges faced by our customers; our goal being to deliver products and services with practical applications and demonstrable value”. The tone of the statement is quite encouraging, at least in light of the last few years and GTC’s struggles to win business during the oil-price downturn. I wonder if the new chief exec is now implementing a more profit-focused approach to the business. You see, GTC was formed by professors from Leeds University and I suspect the business may have had more of an academic bias in the past. I still maintain that GTC has diverged away from the bulk of my portfolio, what with its unproven chief exec and various acquisitions. But at least there are now signs of a recovery appearing at the business.